Utrecht is building a new Station Area. This was much needed; ever since the Hoog Catharijne shopping mall was built in the 1970s, there had been overdue maintenance, neglect, a growing number of passengers, a growing city and the desire to get water back in the old canal. With the construction of a new and renewed area all these issues are being tackled at once. The historic inner city and the Station Area were two separated parts of Utrecht; these parts will be connected again to form one coherent centre. Liveliness and safety will be improved. There will be space for culture and leisure, the area will be more accessible and last but not least: water will flow once again in the canal that was filled in during the 1970’s. They are building a future that’s sustainable: low emission buildings, plenty of pleasant space for bikes, public transport and pedestrians, and solar cells on top of platforms. The building of the Utrecht Station Area is being done with close co-operation between the City of Utrecht, Corio (owner of Hoog Catharijne mall), Dutch Rail, ProRail and the Jaarbeurs (tradefair). 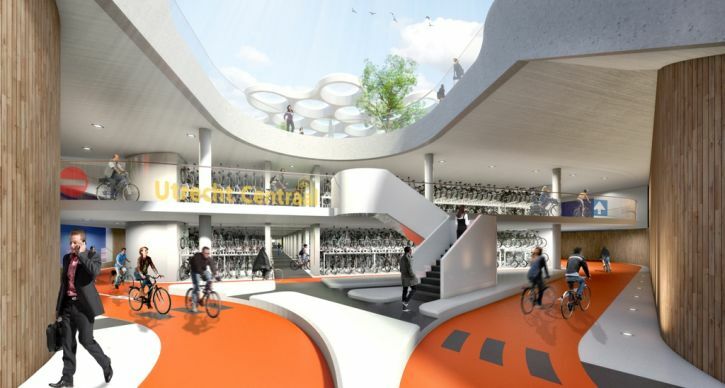 The upcoming mega bike storage will be below an elevated station on the city side of Utrecht Central Station. In addition to the Station Square East there will be a futuristic hood. The first part will be ready in 2016 and, in 2018, the entire parking facility and the square on top of it will be complete.